SAN DIEGO, CA April 25, 2016 –The GI Film Festival, hosted annually in Washington, D.C. and Virginia, will celebrate its second year in San Diego in partnership with KPBS and the Film Consortium San Diego. Scheduled for September 14 – 18, 2016, the festival will feature films for, about, and by service men and women and will include the local film showcase and awards ceremony. The festival aims to reveal the struggles, triumphs, and experiences of the military through compelling and authentic storytelling. All major film genres will be featured including dramas, documentaries, shorts, and personal narratives. The local film showcase demonstrates a commitment to San Diego’s local military community. Productions selected as part of the local film showcase must be about the Southern California military experience and be completed after January 1, 2011. Local films can be made by individuals who have served or are currently serving in the U.S. military or have more than half of the cast, crew, or locations sourced from San Diego or Imperial County. Filmmakers interested in participating in the festival’s local film showcase can review requirements and categories via the online submission form. The early-bird deadline is June 1. The festival is part of an expanding station initiative to better serve local military with meaningful content. Such content includes the radio series Incoming which featured stories written and narrated by local veterans. KPBS also contributes to the NPR series Back at Base, a multi-station collaborative chronicling the lives of U.S. troops in their local communities. 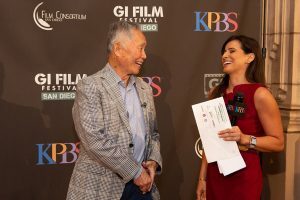 By presenting the GI Film Festival San Diego for a second year, KPBS will continue to build on its military-related content and engagement programs. Highlights from the 2015 festival included a family movie night aboard the USS Midway Museum, filmmaker talks, panel discussions, and the awards ceremony for the local film showcase. Events took place around San Diego County. This summer, festival organizers will announce the 2016 festival schedule, ticket prices, and venues. Many of the events will be open to the public with special discounted opportunities for active duty personnel and veterans. Additional information is available at gifilmfestivalsd.org. The GI Film Festival San Diego is presented by KPBS in collaboration with the GI Film Group and the Film Consortium San Diego. KPBS serves the San Diego community with news and entertainment programming that respects our audience with inspiring, intelligent and enlightening content. KPBS delivers this content via multiple outlets, including television, radio, and digital media and will adapt and remain relevant in a rapidly changing world.